Let’s say for some time you single-handedly make something that people love to consume: cinnamon buns, maybe, or content. You decide to go big with your operations and bring more bliss into the world. Boatloads of bliss. We’re talking content (or cinnamon buns) galore. We’re talking more than simply doing more of what you’re doing. You need to do more than throw more people at the situation. To handle increased complexity, you need updated processes, new strategies, and more automation. For example, in Automating Content Reuse: One Marketing Team’s Story, Jen Brass Jenkins tells the story of the content teams at the University of Utah Health Care system who are revamping the way they create, tag, distribute, and manage their content so they can reuse their content in smarter ways and get it in front of more readers. Create content potlucks! How? Invite content developers across the organization ­– technical writers, professional service consultants, trainers, support engineers, and so on – to participate in online communities. This is a low-cost way to build relationships and discuss the value of applying content marketing principles to all types of content. You’ll discover ways that subject-matter experts can contribute to blog posts, videos, and forums, building credibility with prospective and existing customers alike. Customers like to hear tales from the field and learn from peers. Ask hard questions about what you can outsource or crowdsource versus what you have to do in-house. Lean into the diversity and flexibility of external resources to maximize the effectiveness of your content and your budget. Involve more subject-matter experts and content creators across the organization. Tell their stories. Tap the passion of customers with user-generated content from social media to branded communities. To attract more subject-matter experts, influencers, and others who can add to your wealth of stories to share, hold more events. Events create deadlines for high-value content that can be published and repurposed in multiple forms. Build a content team that includes storytelling artists (writers), data wizards, and community managers. The flow should go from data – what to write about, when to write it, where to publish it – to story, to building a strong community that needs your specific content. Spin off your content creators into their own Agile team. Include cross-functional members, giving the team all the necessary skills for producing content from start to finish. Allow teams to self-organize, set their own schedules, and stay focused on mission-critical content. If you hire great people, put them on an Agile team, and provide them with a strategy to execute against, you can dramatically scale up without any loss of content quality. Go retro and be OK with doing manual work before rushing into buying a technology to solve your problems. Often, I see marketers decide to implement technology to solve a problem that is actually a people or process problem, only to discover that in hindsight during the technology implementation. By doing the work manually ­– and being disciplined about documenting the current process, or lack of process ­– you will discover holes to be fixed and improvements to be made. All this knowledge will help you select appropriate technology and prepare for a smooth implementation. In other words, adjust your processes first. You have to adjust your processes eventually anyway. I simply recommend doing it as part of the technology decision process instead of part of the technology implementation process. Addressing your issues up front helps you make a more informed technology decision and eradicates poor processes before you replicate them inside a new technology. Integrate content efforts across the customer life cycle. The customer’s content journey doesn’t stop when a lead is handed off. Content is part of the ongoing experience, integral to not only conversion but also retention. If your authors compose directly in a CMS, provide fill-in-the-blank content templates that prompt them for all the content – and metadata – they need to submit. Where possible, prefill the metadata fields for them (for example, event hashtags). If authors compose in Word or another application, give them template files they can fill in so that your production team has everything it needs to enter the content – and metadata – into the CMS. Whatever kind of templates you use, include fields for social media sharing. It’s more efficient to populate this content early in the creation process. A lead copywriter can work with the social team to write tweets, for example, rather than someone having to come up with the tweets cold later in the process. Templates are especially helpful for mobile submissions since typing can be tedious on the road. Success with scalability is in the details – things like knowing the words and phrases your audiences use to describe what they care about. Align everyone in your content ecosystem on things you do and don’t want to see in your content. Communicate your style and tone preferences. Document your guidelines, with examples, and make your documentation. A link to your guidelines isn’t enough. Expecting your content creators to spend time regularly searching for guidance is unrealistic. It won’t happen. Instead, explore ways to deliver guidance in manageable chunks, ideally right in the authoring environment. Create one or more editorial boards, depending on the size of your organization. Editorial boards enable you to scale in so they can align strategy and publication efforts for various audiences across functions and business units. An editorial board coordinates content activities around a shared target – for example, a vertical (like health care), a customer segment (like pediatric nurses), a publication (like a blog), a business unit, or some combination. An editorial board may have both core and extended members. Core members typically include content strategists, writers, editors, marketers, and others responsible for planning and executing content. Extended members typically include stakeholders who depend on the content (like salespeople) and subject-matter experts (like people who know your customer segments or your technology well). To address matters of scale comprehensively, look across the landscape of your audiences and define a content roadmap. Plan the evolution of your editorial boards accordingly. Build your reservoir of content around strategic themes: three to six top-level themes based on your strengths and differentiators. Content that aligns with a strategic theme holds its message as it scales. Building content based on themes is like building with Legos. Your content teams pick and choose from existing bits within a given theme to quickly assemble new content deliverables – from blog post to presentation to web copy to email to tweet. When all content aligns with at least one strategic theme, it’s easier for employees and partners to use that content for their own needs – the essence of scaling. I’ll speak from the perspective of a solo marketer or a small team. Take the time to understand every part of your brand and translate that understanding into a cohesive business strategy. This is especially relevant with data mining and segmentation. Maybe take a week and dedicate half your work hours to segmenting. You’ll learn who your prospects are and who they should be, and you’ll be able to provide the right guidance to freelancers to ensure that you scale successfully. My go-to discipline for 2017 is customer-journey mapping, aka service-design thinking. I don’t mean mapping the buying cycle in broad strokes; I mean looking at audience goals and how they’re accomplished in the wild. Imagine that you’re designing a retail store or a new gadget instead of content. Think that way: Where will people be when they use your content? How will they be feeling? How often will they come back? Why did they come there in the first place? Answering questions like these will help you understand your audience in focused ways and help you refine the types of content you want to deliver. Content models! Scaling requires systematizing, and models allow for patterns of deliverables, navigation, interaction, etc., to be captured and provided across a team to systematically ensure consistency while preserving teams’ ability to be creative. Nearly any content can be modeled. A good senior content strategist has the skills to implement a modeling program for you. ­If you want to really scale, you must store each piece of content and each piece of data (whether for products, for customers, or for transactions) in only one place – without duplication – and employees, systems, and customer-facing environments must be able to get at those pieces and reuse them (as in “create once, publish everywhere”). This kind of foundation enables every new campaign, website, or other customer-facing initiative to use – and enrich – the same information set. It also enables content teams to avoid wasting time they would otherwise spend on multiple information systems, repositories, and processes. A scalable information foundation supports operational excellence, the pillar that customer intimacy rests on. Get smart about artificial intelligence in marketing tech. AI will help us understand why something happened, not just that it happened. We need not just numbers but the numbers’ implications. No good salesperson is comfortable acting on a lead that has been scored as an eight out of 10, say, with no way to make sense of those numbers. You need to know why someone’s an eight so that you can decide what to do next or what conversation to have. As your content efforts expand, identify tools and platforms that the content teams will share. This approach helps you scale in that you maintain governance of your content-publishing workflow. Governance covers a lot of concepts. In this case, I’m talking about consistency across your shared content platforms. Slack, Dropbox, SharePoint, Basecamp, and Outlook are all fine; what matters as your team grows is that everyone uses the common platforms in consistent ways. While individual teams (for example, designers) may work with their own tools and platforms for their internal deliverables, when it comes to sharing and collaborating, you’ll need a structured workflow designed around common platforms. Since multiple departments touch the same content asset before and after it gets published, you may need to establish file-naming conventions and teach your team how to manage versions of shared content assets. Everyone may need to learn how to use shared folders, FTP, and other things related to the pain points you have with cross-functional teams. All my projects involve scaling up content operations in one way or another. Many clients want to tailor the same message to different audiences or delivery channels without having to rewrite content from scratch each time. Others need to author search friendly content without handwriting all the code or to share content with other organizations with a minimum of pain and fuss. The two key approaches that help teams scale content operations in this way are structured content and semantic technologies. Used together, these approaches are powerful. It takes effort and learning to use them – they’re more like families of technologies than simple tools – but they’re the key to delivering great content experiences at scale. Define how collaborative tooling and processes enable your organization to deliver more variations on your message to more audience segments without significantly ramping up the number of people required to do it. Build a central repository of content, which is tagged for use and reuse, and searchable by all content teams. Use something like Acrolinx that builds guidance into your authoring tool to help content creators conform to standards and to govern all content within the repository. Identify desired content assets and appropriate channels. Put shape and structure to the content assets in the form of a content model. Add targeting categories or tags to the content following a taxonomy. Add standardized microdata (like Open Graph or Schema.org markup) that match your target channels. Build rules for personalization starting by segmenting audiences and their behaviors. Of course, the organization must have a strong delivery platform – a customer experience management system – in place. And marketers should build management patterns and habits that support content engineering and optimization long term. It’s not easy to go from cinnamon-bun maker to Cinnabon. 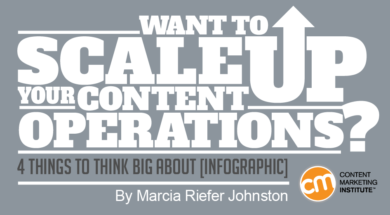 Scaling any operations – content operations included – requires big thinking about people, processes, strategy, and technology. What lessons have been most valuable to you as you’ve seen content operations scaled up? Please share your experiences with our readers in a comment below.